← One day, the breaks just failed. Today, it seems long ago and far away that ordinary men could write, reasonably well, a simple commercial note. Today, only extraordinary men can write, reasonably well, an ordinary commercial note. How so, Sir? Why so, Sir? 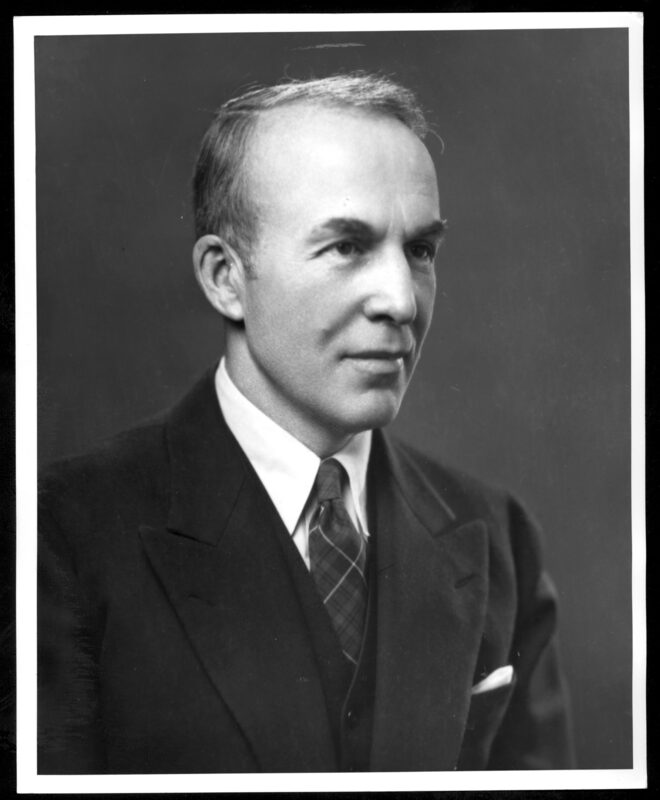 A poet, playwright, lawyer, and statesman, Archibald MacLeish’s roots were firmly planted in both the new and the old worlds. His father, the son of a poor shopkeeper in Glasgow, Scotland, was born in 1837—the year of Victoria’s coronation as Queen of England—and ran away first to London and then, at the age of eighteen, to Chicago. His mother was a Hillard, a family that, as Dialogues of Archibald MacLeish and Mark Van Dorenreveals, MacLeish was fond of tracing back through its New England generations to Elder Brewster, the minister aboard the Mayflower. MacLeish was born in Glencoe, Illinois, in 1892, attended Hotchkiss School from 1907 to 1911, and from 1911 to 1915 studied at Yale University, where he edited and wrote for the Yale Literary Magazine,contributed to the Yale Review, and composed Songs for a Summer’s Day, a sonnet sequence that was chosen as the University’s Prize Poem in 1915. MacLeish married Ada Hitchcock in 1916. Two years later he saw service in France and published his first collection of poems, Tower of Ivory. MacLeish’s personal dilemma, and the constant theme of his early writings, was the reconciliation of idealism with reality. This theme had run through his undergraduate short stories and through his first long poem, “Our Lady of Troy,” which was published in Tower of Ivory. In his own life, he resolved this dilemma by turning from his promising career as a lawyer to pursue the vocation for which the law courts had left him little time—that of poet. In the summer of 1923, MacLeish announced his commitment to poetry by moving from Boston with his wife and two children, into a fourth-floor flat on the Boulevard St. Michel in Paris. The first major period of MacLeish’s poetic career—some would say the only major one—thus began in the early 1920s, when he gave up the law and moved abroad, and closed in the later 1930s, when he took on a succession of “public” obligations. During these years, MacLeish’s work was made up of nine longer poems or sequences of poems, accompanied by lyric meditations and statements in various forms on diverse but characteristic themes: doubt, loss, alienation, art, aging, the quest. The shorter poems, some of them very successful, have by anthologizing and other emphases become better known than the longer ones. MacLeish’s collection, New and Collected Poems, 1917-1984, however, emphasizes the interrelation of his longer and shorter poems, as did his first major collection, Poems, 1924-1933. The Pot of Earth tells the very different story of a very different figure, a young woman deeply affected psychologically or culturally by archetypal myths of woman’s fertility and its transformative powers as seen through “the figure of the dying god whose imaginative presence is at the core of cultural vitality,” according to John B. Vickery in The Literary Impact of the Golden Bough. Obsessed by symbolic mythical images—excessively so in the unrevised version—she dies in childbirth, sought by or seeking a death dictated by myth, the unconscious, or simple biology. To tell her moving story, MacLeish interweaves narrative and lyric forms, regular and irregular verse of great eloquence that reinforces the pathos, irony, and mystery of her fate. Besides marking the first publication of Einstein, 1926’s Streets in the Moon has some of MacLeish’s best and best-known shorter poems. In “Memorial Rain” (directly) and in “The Silent Slain” (indirectly) MacLeish came to what terms he could with concerns identified in Paul Fussell’s The Great War and Modern Memory. “The Farm” illustrates the search for New England roots that ran through MacLeish’s career and his writings in prose and verse. Other poems reflect the varying expatriate moods that came together after a few years in “American Letter.” And the too well-known, too often misunderstood “Ars Poetica” conveys in its images, imitative form, and self-contradictions MacLeish’s permanent conviction that a poem should both mean and be. Citing The Hamlet of A. MacLeish, Leslie Fiedler in Unfinished Business identified four appeals of the story of Hamlet to the American imagination: 1) “anguish and melancholy,” 2) “the notion of suicide,” 3) “the inhibitory nature of conscience,” and 4) “an oddly apt parable of our relationship to Europe.” This poem, MacLeish’s most complex and elaborate, addresses all four subjects. Combining and contrasting what Fiedler elsewhere called signature and archetype, autobiography and myth, the work, which contains fourteen sections and a Shakespearean gloss, juxtaposes dialecticallyHamlet, MacLeish’s personal and poetic autobiographical uncertainties, and two fulfilled quests—a medieval Grail romance and tribal migrations out of the Anabase of Saint-John Perse, whose fulfillment only intensifies the doubts and despairs of Hamlet/MacLeish. As he recorded in A Reviewer’s ABC, Conrad Aiken, who had foundEinstein “a long poem which any living poet might envy, as rich in thought as it is in color and movement,” labeled The Hamlet of A. MacLeish “a kind of brilliantpastiche,” although “full of beautiful things.” Aiken went on, however, to pose the unanswered question of “whether [MacLeish’s] ‘echoes’ might not, by a future generation, be actually preferred to the things they echo.” Often, in MacLeish’s work, such “echoes” are a form of brilliant, purposeful parody, an additional stylistic power finally recognizable fifty postmodern years later for what it is. Conquistador, too, combines the old world and the new, but by 1932, the year of the book’s publication, the choice had become clear if often tragic in its outcome. In the conquerors of Central American native civilization MacLeish found a romantic, exotic history that could also serve as a myth, a metaphor, for closer, more familiar history and concerns. In Montezuma, Cortez, and Diaz, the poem offers three figures—god, hero, and man—who share the reader’s attention and good will and who are examined in an ironic context of human blood and natural beauty, greed for gold and sun-worship, political intrigue and heroic quest. Seeing the poem wholly through its narrator, Diaz, Allen Tate praised the poem for its “finely sustained tone,” its “clarity of sensuous reminiscence,” and its “technical perfection,” but found in its sentimentality “one of the examples of our modern sensibility at its best; it has the defect of its qualities,” as Tate recorded in Essays of Four Decades. Among the other new poems in Poems, 1924-1933, “Frescoes for Mr. Rockefeller’s City” (also published separately in 1933) dealt with a public controversy and caused additional public excitement. 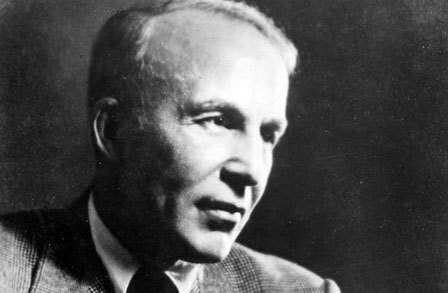 Although praised by Cleanth Brooks in Modern Poetry and the Tradition, it has “not only ideological but functional problems,” as Grover Smith declared; and some of its sections, like several of MacLeish’s other public poems of the 1930s, reveal “the absence of arresting images and the slackness of the rhythm” that troubled David Luytens in The Creative Encounter. However, as recorded inLiterary Opinion in America, Morton D. Zabel also found in these public poems “a signal of profitable intentions” and discovered “a very moving beauty” in the very unpublic set of lyrics, “The Woman on the Stair,” in Public Speech. The last of MacLeish’s longer poems of the 1930s was America Was Promises. In an essay collected in A Poet’s Alphabet, Louise Bogan attacked it as “MacLeish’s saddest and most conglomerate attempt at ‘public speech’s’ to date . . . political poetry, even a kind of official poetry,” but Grover Smith later reassessed it as “the most eloquent of the ‘public’ poems . . . much better as a poem than as a message: for once, MacLeish’s adaptation of St.-J. Perse’s geographic evocations seems precisely right.” America Was Promises combines such “geographic evocations” with a quasi-allegorical, populist history of Jefferson and Man, Adams and the Aristocracy, Paine and the People. ForThe Human Season: Selected Poems, 1926-1972 MacLeish cut from America Was Promises almost all its “official” poetry and possibly made it a much better poem. In 1924 The Happy Marriage had explored the idea that out of the union of the ideal and the real must emerge a more mature sense of individual identity. This same theme carried through MacLeish’s 1926 poetic drama, Nobodaddy, a verse play that uses the Adam and Eve story as “the dramatic situation which the condition of self-consciousness in an indifferent universe seems to me to present.” MacLeish would affirm, a few years later, that the poet’s role was “the restoration of man to his position of dignity and responsibility at the centre of his world.” Nobodaddy provided its author with the opportunity to return to humankind’s origins, to explore the human condition in terms of its myths and mysteries. To MacLeish, the work was a simple and forthright play of the beginnings of human consciousness. In the resolution of his own sense of self-consciousness, symbolized by his move to Paris in 1923, MacLeish showed a certain kinship with his character Cain. Both had found the strength necessary to sever—in Cain’s words—the thick vein “that knots me to the body of the earth,” and to grab control of the centers of their own worlds.Nobodaddy is the story of humankind attempting to make sense of the chaos of its life. It can also be read as the apologia for its author. And its theme of a world in which humankind is bewildered and bored, a world in which its knowledge is not matched by its understanding, is one that would run through much of MacLeish’s writing during the 1920s. MacLeish’s first produced stage play, Panic: A Play in Verse, is a variation on the Cain story set against the background of the American Depression and a generation of capitalists he felt were in the process of leaving capitalism “intellectually defenseless and unarmed.” The conflict of the play is between the will of a man (McGafferty, played in the original production by Orson Welles) and a fatalistic concept of human life (dialectical materialism). McGafferty surrenders to the delphic oracle of Marxist determinism and thus falls victim to it. As the Blind Man in the play observes, the financier fails because (unlike Cain) he will not trust his own freedom. The Trojan Horse, a verse drama first presented on the BBC in 1952, is in many ways a return to earlier decades and earlier characters. Helen of Troy had been earlier seen in a closet drama titled Our Lady of Troy and collected in MacLeish’s Tower of Ivory.She had later appeared in The Happy Marriage as the symbol of Beauty. The Blind Man, who earlier laid the future before McGafferty in Panic, has the same function here. Paul Brooks, in a note accompanying the first edition of The Trojan Horse, tied the play to the McCarthy era, but the script was intended more generally to explore in myth the sense of deception the poet had perceived in his own century. The poetic sense of awareness itself is presented in a 1953 play, This Music Crept by Me upon the Waters, where Elizabeth, as did Cain before her, experiences the discovery of her own place in the cosmos. The public voice that found its way into MacLeish’s poetry in the 1930s was a reflection of the sense of public responsibility he had come to accept on his return from Paris. Harriet Monroe in a 1931 issue of Poetry, wrote that she has “much faith in the ability of this poet to interpret his age: he has the thinking mind, the creative imagination, the artistic equipment of beautiful words and rhythms.” This voice was heard most directly in the many articles and speeches MacLeish wrote on the role of the poet and, through the political chaos of the western world in the 1930s and 1940s, on the direction he felt America should be pursuing. Much of this material has been collected in A Time to Speak, A Time to Act, and A Continuing Journey. Also, as Falk points out, MacLeish committed himself to such public offices as Librarian of Congress from 1939 to 1944, assistant director of the Office of War Information in 1942, Assistant Secretary of State from 1944 to 1945, and chair of the U.S. delegation to the founding conference of UNESCO in 1945. 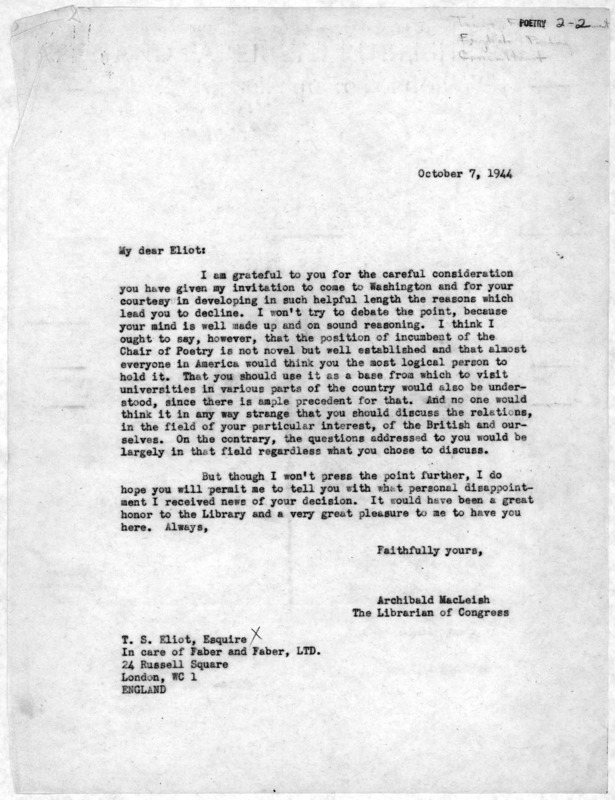 MacLeish said several times that in the long poem “Actfive,” published in Actfive and Other Poems in 1948, he tried to come to terms with his and the world’s experiences in the immediately preceding years: the challenge and suffering of World War II, the opportunities and failures of the peace, the loss of so many faiths. Conquistador had offered an implicit choice between god, hero, and man; “Actfive,” in its three scenes, redefines and makes that choice. With the God gone, the King dethroned, and Man murdered—all in elegiac, characteristically despairing lines—the heroes of the age are then thrust forward in their emptiness through sardonically abrupt rhythms. They give way, in turn, to “the shapes of flesh and bone,” in whose moving, subtly musical, indirect voices MacLeish’s long involvement with Matthew Arnold is fulfilled. The result is a poetic affirmation, “humanist and existentialist,” according to Luytens, for an even darker, more confused, post-Arnoldian time. “Actfive” was MacLeish’s last poem to interweave lyric statement and emblematically condensed narrative within an extended structure of feeling and idea. In the ten years from 1944 to 1954, called by Grover Smith “his second renaissance,” he published over eighty short poems, half of them, apparently, written in two very creative years after he began teaching poetry at Harvard, where he was Boylsten Professor from 1949 to 1962. In style these poems, having many forms and treating a great variety of subjects, might be called neo-modernist, embodying a riper, wiser Imagism, for example. But their combination of immediate, personal concern with impersonal form, image, and language is not easily labeled. Poets Hayden Carruth in Effluences from the Sacred Cave, Richard Eberhart in Virginia Quarterly Review, John Ciardi in Atlantic,and Kimon Friar in New Republic have all praised these poems. The best of these short works succeed, not surprisingly, in the terms of MacLeish’sPoetry and Experience, which defines the “means” by which and the “shapes” in which poetry finds its “end” meaning. In brief, MacLeish contended, poetry combines sounds, signs, images, and metaphor to give meaning to the private world (Emily Dickinson), the public world (William Butler Yeats), the anti-world (Arthur Rimbaud), and the arable world (John Keats). After receiving a Pulitzer Prize, his third, for J. B., MacLeish returned to man’s quarrels with the gods in Herakles, first produced in 1965 and published in 1967. During the first part of the play, Professor Hoadley is drawn to Greece, the patria of the intellectual life, in search of the spirit of Herakles, the half-man, half-god who dared to struggle with the unanswered questions of the universe. Balancing Hoadley’s search for intellectual perfection is his wife’s conviction that life is a concrete reality including the human imperfection her husband would transcend. In the second half of the play, a frustrated Herakles fails to receive a sign from Apollo and angrily ascends to the temple door threatening to answer his own oracle. But, despite the merits of his deeds, he is unable to perform the god-like act of pronouncing his own destiny. In the end, Hoadley’s wife and Herakles’s Megara refocus the human spirit where J. B. had earlier found it—on the day-to-day occupation of living, not in glorious myth, but in concrete reality. If J. B. and Herakles raise still-unanswered questions, they also affirm that all questions need not be answered. MacLeish’s last full-length play, Scratch, finds its source in “The Devil and Daniel Webster,” Stephen Vincent Benet’s treatment of the mythical American confrontation between man and the Devil. Alone of the final three plays, it explores questions that, because of their American roots, could move closer to resolution within the text. MacLeish felt there were three reasons that Benet’s story had widened into myth: that the Republic had become full of men and women who had sold their souls “for its comforts and amenities”; that “belief in hell was reviving everywhere and that, if only love of life could be turned into contempt for living, hope into despair, the entire planet would dissolve into that cistern of self-pity where [Samuel Becket’s] Godot never comes”; and that Daniel Webster’s concern for Liberty and Union, or freedom and government, was as contemporary as it had ever been. Retiring from public life during his last decades, MacLeish became not so much an elder statesman as an elder of various churches: the churches of friendship, of patriotism, of poetry, of love, of death. His talks, interviews, letters, essays, and poems, and his parable-play for radio, The Great American Fourth of July Parade, all voice the recurring, autumnal concerns of “the human season” in a quiet, personal, “elderly” voice. Almost ninety, MacLeish died on April 20, 1982, the day after Patriot’s Day. Poet, dramatist, lawyer, and statesman. Admitted to U.S. Supreme Court Bar, 1942. Harvard University, Cambridge, MA, instructor in constitutional law, 1919; Choate, Hall & Stewart (law firm), Boston, MA, staff member, 1920-23; freelance writer in France, 1923-28; Fortune, New York City, staff member, 1929-38; Harvard University, Cambridge, named first curator of Niemann Collection of Contemporary Journalism and adviser to Niemann fellows, 1938; U.S. Government, Washington, DC, served as Librarian of Congress, 1939-44, director of Office of Facts and Figures, 1941-42, assistant director of Office of War Information, 1942-43, and Assistant Secretary of State, 1944-45; Harvard University, Boylston Professor of Rhetoric and Oratory, 1949-62, Boylston Professor Emeritus, 1962-82. U.S. delegate to Conference of Allied Ministers of Education in London, 1944; served as chair of U.S. delegation to London conference drafting UNESCO constitution, 1945, as first U.S. delegate to General Conference of UNESCO in Paris, 1946, and first U.S. member of Executive Council of UNESCO. U.S. Department of State lecturer in Europe, 1957; Simpson Lecturer, Amherst College, 1963-67. Museum of Modern Art, New York City, trustee, beginning 1940; Sara Lawrence College, Bronxville, NY, trustee, beginning 1949. Songs for a Summer’s Day (sonnet cycle), Yale University Press (New Haven, CT), 1915. Tower of Ivory, Yale University Press, 1917. The Happy Marriage, and Other Poems, Houghton (Boston), 1924. The Pot of Earth, Houghton, 1925. Streets in the Moon, Houghton, 1926. The Hamlet of A. MacLeish, Houghton, 1928. New Found Land, Black Sun Press (limited edition), 1930, Houghton, 1930. Conquistador (narrative poem), Houghton, 1932. Frescoes for Mr. Rockefeller’s City, Day, 1933. Poems, John Lane (London), 1935. Public Speech, Farrar & Rinehart, 1936. Land of the Free, Harcourt, 1938. Collected Poems: 1917-52, Houghton, 1952. Songs for Eve, Houghton, 1954. The Collected Poems of Archibald MacLeish, Houghton, 1963. The Wild Old Wicked Man and Other Poems, Houghton, 1968. The Human Season: Selected Poems, 1926-72, Houghton, 1972. New and Collected Poems, 1917-1976, Houghton, 1976. New and Collected Poems, 1917-1984, Houghton, 1985. Housing America (articles from Fortune), Harcourt, 1932. Jews in America (first published in Fortune ), Random House, 1936. Libraries in the Contemporary Crisis, U.S. Government Printing Office, 1939. Deposit of the Magna Carta in the Library of Congress on November 28, 1939, Library of Congress, 1939. The American Experience, U.S. Government Printing Office, 1939. The Irresponsibles, Duell, Sloan & Pearce, 1940. The American Cause, Duell, Sloan & Pearce, 1941. The Free Company Presents… The States Talking (radio broadcast, April 2, 1941), [New York], 1941. The Next Harvard, Harvard University Press, 1941. Prophets of Doom, University of Pennsylvania Press, 1941. A Time to Speak, Houghton, 1941. (With William S. Paley and Edward R. Murrow) In Honor of a Man and an Ideal… Three Talks on Freedom (radio broadcast, December 2, 1941), [New York City], 1942. American Opinion and the War (Rede Lecture at Cambridge University, Cambridge, England, 1942), Macmillan, 1942. A Free Man’s Books (limited edition), Peter Pauper, 1942. A Time to Act, Houghton, 1943. The American Story: Ten Broadcasts (presented on NBC Radio, 1944, and for which MacLeish served as commentator), Duell, Sloan & Pearce, 1944, 2nd edition, 1960. Martha Hillard MacLeish, 1856-1947, privately printed, 1949. Poetry and Opinion: The Pisan Cantos of Ezra Pound, University of Illinois Press, 1950. Freedom Is the Right to Choose: An Inquiry into the Battle for the American Future, Beacon, 1951. Poetry and Journalism, University of Minnesota Press, 1958. The Dialogues of Archibald MacLeish and Mark Van Doren (televised, 1962), Dutton, 1964. A Continuing Journey, Houghton, 1968. Riders on the Earth: Essays and Recollections, Houghton, 1978.
Letters of Archibald MacLeish, 1907 to 1982, edited by R. H. Winnick, Houghton, 1983. Archibald MacLeish: Reflections, edited by Bernard A. Drabeck and Helen E. Ellis, University of Massachusetts Press, 1986. Panic: A Play in Verse (produced on Broadway, 1935), Houghton, 1935. The Fall of the City: A Verse Play for Radio (presented on CBS Radio, 1937, and on CBS-TV, 1962), Farrar & Rinehart, 1937. Air Raid: A Verse Play for Radio (presented on CBS Radio, 1938), Harcourt, 1938. The Trojan Horse (verse play; presented on BBC-Radio, London, c. 1950), Houghton, 1952. This Music Crept by Me upon the Waters (verse play), Harvard University Press, 1953. J. B.: A Play in Verse (produced at Yale School of Drama; produced on Broadway, 1958), Houghton, 1958. The Eleanor Roosevelt Story (filmscript; produced by Allied Artists, 1965), Houghton, 1965. An Evening’s Journey to Conway, Massachusetts (play; produced for NET Playhouse, 1967), Gehenna Press, 1967. Herakles (verse play; produced, 1965), Houghton, 1967. Scratch (based on short story by Stephen Vincent Benet, The Devil and Daniel Webster; produced on Broadway, 1971), Houghton, 1971. The Great American Fourth of July Parade: A Verse Play for Radio, University of Pittsburgh Press, 1975. Six Plays (contains Nobodaddy, Panic, The Fall of the City, Air Raid, The Trojan Horse, and This Music Crept by Me upon the Waters), Houghton, 1980. (Co-author with editors of Fortune) Background of War, Knopf, 1937. (Author of foreword) William Meredith, Love Letters from an Impossible Land, Yale University Press, 1944. (Author of introduction) St. John Perse (pseudonym for Alexis Saint-Leger Leger), Eloges and Other Poems,Norton, 1944. (Editor) Gerald Fitzgerald, The Wordless Flesh, [Cambridge], 1960. (Editor) Edwin Muir, The Estate of Poetry, Hogarth, 1962. (Contributor) Let Freedom Ring, American Heritage, 1962. (Editor with E. F. Prichard, Jr., and author of foreword), Felix Frankfurter, Law and Politics: Occasional Papers, 1913-38, Peter Smith, 1963. (Editor) Leonard Baskin, Figures of Dead Men, University of Massachusetts Press (Amherst), 1968. (Author of introduction) The Complete Poems of Carl Sandburg, Harcourt, 1970. 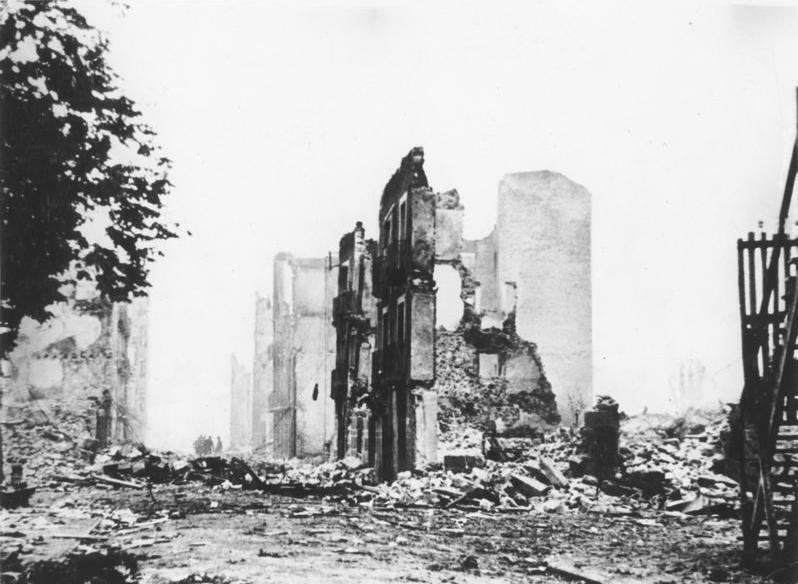 Archibald MacLeish describing the results of Guernica, Basque village, first air raid on mainly civilian targets, in his radio play scripts.